and with the support of the Samburu County Government. We'll let Save the Elephants' David Daballen take it from here. -Ed. It’s a wild life at the Save the Elephants research camp in Samburu, in the heart of northern Kenya’s wilderness. For the last 15 years at Save the Elephants, I’ve spent my days among the elephants, working alongside my fellow Samburu people to study and protect them. Research shows that 100,000 elephants across Africa were killed for their ivory between 2010-2012, but thanks to our work in the Samburu National Reserve their numbers are now slowly increasing. Today, a visit to Samburu is a chance not only to see these magnificent creatures in their natural habitat, but also discover a uniquely beautiful landscape where people’s lives are interwoven with the landscape’s wildlife. 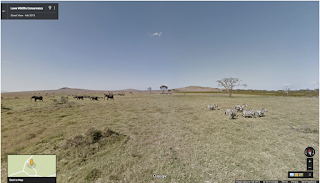 It’s my honour to invite you on a journey to my homeland with Street View in Google Maps. Every time I drive into the Reserve, I can see the trust on the elephants’ faces and feel a warm welcome. When I’m out and about, I never know which of my fellow citizens I’ll bump into next. It could be some of the 600+ elephants I can recognize—like the Hardwood family—frolicking together, a group of Samburu warriors walking along the Ewaso Nyiro River, a pride of lions enjoying a bit of shade, or a leopard crossing the path. 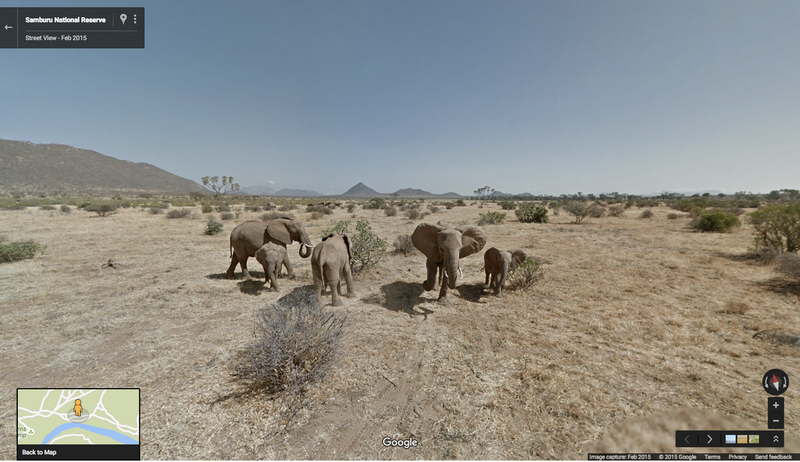 While you make your journey through Street View, you may be surprised what awaits. South of Samburu, up into the hills of Kenya, the Lewa Wildlife Conservancy awaits exploration. In this greener landscape, you can cross the open savannah, where animals like zebras and rhinoceroses live protected from poachers and hunters. Every day, the Lewa radio command center plots the movements of elephants (and other GPS-collared wildlife) onto Google Earth to help rangers determine where elephants are and when they might be in danger. If an elephant’s GPS collar sends an alert to indicate the elephant has stopped moving, a team of rangers and tracking dogs will investigate. Save the Elephants was one of the first organizations to use this technology, having collared 266 elephants across Africa since 1998. Visiting the David Sheldrick Wildlife Trust, you can see the devastating effect of poaching and other causes of elephant deaths in Kenya. Founded in 1977, the Trust provides lifesaving assistance to wild animals in need, including orphaned elephants and rhinos. At their Elephant Orphanage in Nairobi, elephant caretakers stand in for an elephant’s lost family, providing 24/7 care and specially formulated milk. As the orphans grow, they are gradually reintegrated back into the wild, where they are protected by the charity’s Anti-Poaching and Aerial Surveillance Teams. To date, the David Sheldrick Wildlife Trust has hand-raised more than 180 orphaned infant elephants, including little Sokotei, who I helped to rescue in Samburu after his mother died of natural causes when he was six months old. He’s just one elephant amid thousands that have been lost across the continent, but when you're up against a challenge of this scale, every elephant counts. I hope this glimpse into life in Samburu has inspired you to learn more about elephants’ plight and how you can help. Samburu is my home and is full of life. To ensure it remains that way, please consider supporting the research of Save the Elephants, making a donation to the anti-poaching efforts of Lewa Wildlife Conservancy, or fostering an orphaned elephant at the David Sheldrick Wildlife Trust. After exploring in Street View, come and see us here in Kenya in person—we’d love to have you! 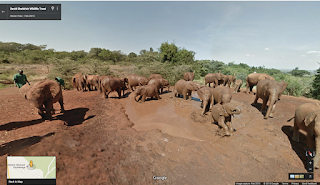 Aujourd'hui et pour la première fois, nous publions des images du Kenya avec Street View, notamment de la Réserve nationale de Samburu, du Lewa Wildlife Conservancy et du David Sheldrick Wildlife Trust, en partenariat avec l'association Save the Elephants et avec le soutien du Samburu County Government. Passons maintenant la parole à David Daballen de l'association Save the Elephants. -Ed. Le the Save the Elephants research campà Samburu est situé au beau milieu de la faune sauvage, au cœur de la nature vierge du nord du Kenya. J’ai passé ces 15 dernières années aux côtés de l'association Save the Elephants, à étudier et protéger les éléphants avec mes collègues de Samburu. Nos recherches ont montré qu'entre 2010 et 2012, 100 000 éléphants ont été tués pour leur ivoire à travers toute l'Afrique. Grâce au travail que nous avons réalisé à la Samburu National Reserve, ces chiffres commencent à lentement diminuer. Aujourd'hui, visiter Samburu vous donnera l'occasion non seulement d'observer ces magnifiques créatures dans leur habitat naturel, mais aussi de découvrir des paysages d'une beauté extraordinaire où la vie des communautés est étroitement liée à celle de à la faune sauvage. C’est pour moi un honneur de vous inviter à visiter mon pays avec Street View in Google Maps. Chaque fois que je fais un tour dans la Réserve, je peux lire dans les yeux des éléphants qu’ils se sentent en confiance et que je suis le bienvenu. Quand je me promène, je ne sais jamais qui je vais rencontrer ce jour-là : ce peut être l'un des quelque 600 éléphants que je suis capable de reconnaître, comme la the Hardwood family, en train de s'ébattre joyeusement, ou bien un groupe de guerriers Samburu marchant le long de la rivière Ewaso Nyiro, une horde de lions profitant de l'ombre, ou encore un léopard traversant la piste. Lorsque vous parcourrez les images sur Street View, attendez-vous à être surpris par ce que vous y découvrirez. En visitant le David Sheldrick Wildlife Trust, vous pourrez constater les effets dévastateurs du braconnage ainsi que les autres causes de décès des éléphants au Kenya. Créé en 1977, ce Trust offre une assistance aux animaux sauvages en détresse ou en danger de mort, y compris les petits éléphantaux et rhinocéros orphelins. À l’orphelinat des éléphants de Nairobi, les gardiens d'éléphants se relaient auprès d'éléphanteaux ayant perdu leur famille en leur apportant des soins 24h sur 24 et 7 jours sur 7 ainsi que du lait spécialement formulé. À mesure que les petits orphelins grandissent, ils sont réintégrés petit à petit à leur environnement naturel où ils bénéficient ensuite de la protection des équipes anti-braconnage et de la surveillance aérienne de l'association caritative. À ce jour, le David Sheldrick Wildlife Trust a élevé au biberon plus de 180 éléphanteaux orphelins, y compris le petit Sokotei, que j'ai aidé à sauver à Samburu, après que sa mère soit morte de causes naturelles alors qu'il n'avait que six mois. Il s'agit juste d'un éléphant parmi des milliers d'autres disséminés sur l'ensemble du continent, mais quand vous avez pris le parti de relever un défi de cette taille, chaque éléphant compte. J'espère que ce petit aperçu de la vie à Samburu vous aura donné l'envie d'en savoir plus sur les éléphants en détresse et de quelle manière vous pouvez les aider. Samburu, c'est chez moi, et c'est un lieu plein de vie. Pour garantir que les choses resteront telles qu'elles sont, n'hésitez pas à soutenir les recherches réalisées par l'association Save the Elephants en faisant un don pour renforcer les campagnes contre le braconnage de la Lewa Wildlife Conservancy, ou en parrainant l'un des éléphanteaux orphelins du David Sheldrick Wildlife Trust. Après avoir exploré les lieux avec Street View, venez nous voir en vrai au Kenya : nous serions ravis de vous accueillir ! 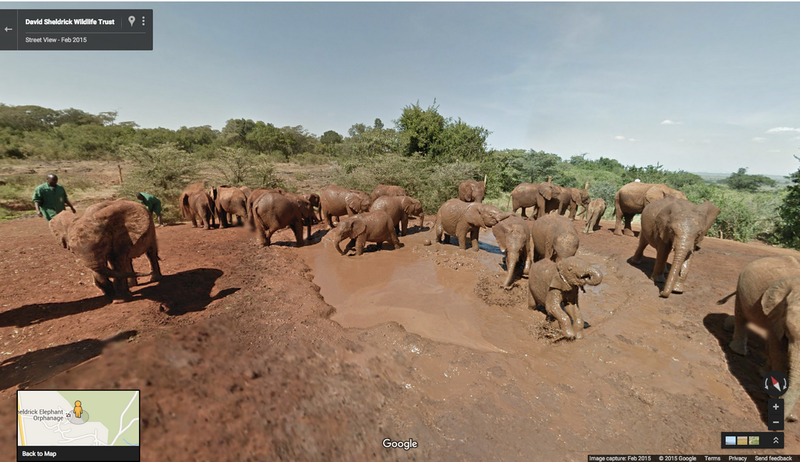 Today for the first time, we’re releasing Street View imagery of Kenya—including the Samburu National Reserve, Lewa Wildlife Conservancy and the David Sheldrick Wildlife Trust—in partnership with Save the Elephants and with the support of the Samburu County Government. We'll let Save the Elephants' David Daballen take it from here. -Ed. Sawubona! Google for Nonprofits launches in South Africa, Kenya and Botswana. noted that most NGOs in South Africa are under-resourced. Their access to internet and technology tools is limited - mostly due to lack of funding. Also, lack of understanding of how to use web technologies means that they often end up paying huge amounts of money for proprietary software, which they may not use or even need. Many non profit organizations find it hard to incorporate the web into their day-to-day work and operations. We know that many nonprofits require hands-on help to optimize the use of the web and Google tools. So earlier this year, we launched the Google Academy for NGOs in South Africa, where we hosted a series of workshops in South Africa, training nonprofits on how to harness the power of the web to work smarter and better. We met with more than 130 NGOs from Gauteng, Eastern Cape, KwaZulu-Natal and the Western Cape, working on a range of issues such as youth empowerment, breast cancer awareness, gender equality, democracy and good governance . NGOs in South Africa are already leveraging Google's tools for nonprofits with amazing results. The Smile Foundation, which helps fundraise for reconstructive surgery for children with cleft and lip palate, used G4NP tools to grow referrals to their website, increase online donations, and promote their organization to brands and companies for fundraising partnerships. We’re inspired and humbled by stories showing how nonprofits can make positive changes around the world using our tools. If you work for a nonprofit, apply today to see how we can help your organization grow and make even more impact. You have a choice of three languages to use when signing up: English, isiZulu and Afrikaans. As well as South Africa, the Google for Nonprofits programme is also available in Kenya and Botswana. Pour la majorité des associations à but non lucratif à travers le monde, Internet constitue une plateforme indispensable pour accroître leur visibilité, sensibiliser le public et communiquer avec leurs partenaires, les donateurs et les bénévoles. Le plus souvent, les décisions importantes sont liées à la nécessité d’engager des dépenses pour acquérir des outils technologiques alors que les associations font face à des demandes de financement et de ressources multiples et variées. Prenons l’exemple de l’Afrique du Sud. Un rapport publié en 2009 montrait que la plupart des ONG sud-africaines disposaient de ressources insuffisantes. Ces dernières n’ont qu’un accès limité à Internet et aux outils technologiques - qui s’explique en grande partie par le manque de moyens. De plus, le manque de connaissances dans l’utilisation des technologies Internet se traduit souvent par le fait qu’elles consacrent des sommes élevées à l’achat de logiciels propriétaires dont elles n’ont parfois même pas l’utilité. De nombreuses associations à but non lucratif ont des difficultés à intégrer Internet dans les tâches et les opérations au quotidien. Google Ad Grants : Des annonces AdWords gratuites (dans la limite de 10 000 $ par mois) pour promouvoir leurs sites Web sur Google en utilisant le ciblage par mots clés. Google Apps pour les associations : La version gratuite de la suite Business Productivity Google Apps (Gmail, Docs, Forms, Calendar and more), qui permet de gérer le courrier électronique et les documents importants dans le cloud et de travailler sur des documents et ainsi de réduire considérablement les coûts des TI. YouTube pour les associations : Cet outil offre des possibilités de branding sur les canaux YouTube et une capacité de téléchargement accrue. Nous savons que de nombreuses associations ont besoin d’une assistance pratique pour optimiser l’utilisation du web et des outils Google. C’est la raison pour laquelle nous avons lancé cette année en Afrique du Sud la Google Academy for NGOs ce qui a permis d’organiser plusieurs ateliers dans ce pays et de former les associations afin qu’elle puisse exploiter la puissance d’Internet pour travailler plus intelligemment et plus efficacement. Nous avons rencontré les ONG dans le Gauteng, la province du Cap-Oriental, le KwaZulu-Natal et la province du Cap-Occidental. Les ONG basées en Afrique du Sud utilisent déjà les outils Google pour les associations et les résultats sont exceptionnels. La Smile Foundation, qui collecte des fonds afin de financer des opérations de chirurgie reconstructive pour des enfants atteints de fente labiale ou palatine, a utilisé les outils Google pour les associations pour intensifier le trafic vers son site Internet, augmenter les dons en ligne et promouvoir sa association auprès de marques et d’entreprises en vue de conclure des partenariats de financement. Les témoignages montrant comment les associations à but non lucratif peuvent changer le monde grâce à nos outils sont une source d’inspiration et nous donne un sentiment de grande humilité. Si vous travaillez pour une association à but non lucratif, inscrivez-vous dès aujourd’hui pour voir comment nous pouvons vous aider à développer votre association en renforçant son impact. Lors de l’inscription, trois langues vous sont proposées : l’anglais, l’isZulu et l’afrikaans. En dehors de l’Afrique du Sud, le programme Google pour les associations est également disponible au Kenya et au Botswana. For most nonprofit organizations (NGOs) around the world, the web is a vital platform for improving visibility, raising awareness, and connecting with their stakeholders, donors and volunteers. Often, one of the big decisions relates to the need to spend to acquire technology when there are so many competing demands for funding and resources. Take, for example, South Africa. A 2009 report noted that most NGOs in South Africa are under-resourced. Their access to internet and technology tools is limited - mostly due to lack of funding. Also, lack of understanding of how to use web technologies means that they often end up paying huge amounts of money for proprietary software, which they may not use or even need. Many non profit organizations find it hard to incorporate the web into their day-to-day work and operations. Google a beaucoup changé ces 17 dernières, nos services se sont enrichis et ont connu de nombreuses évolutions. Et ce n'est pas fini : l'heure du changement a de nouveau sonné.